The R-22 Spearhead was a fast starfighter design that served as the basis for the RZ-1 A-wing interceptor. The prototype R-22 Spearhead was broadly similar in design and function to the earlier Republic Delta-7 Aethersprite-class starfighter and Eta-2 Actis-class interceptor. A two-seat version* was also produced, following the lineage of the Delta-12 Skysprite-class two-seater; some of this variant were used by the forces of Tammuz-an. The Spearhead was in use by private owners and several defense forces all around the galaxy, like the Tammuz-an defense forces, where they escorted ships in the shipping fleet, and on Abridon at the Abridon Shipyard in Sayan. The R-22 Spearhead became an experimental testbed for the Rebel Alliance, nicknamed the "A-wing," shortly before the Battle of Yavin. During one early operational test, the Rebels sent a lone R-22 to attack an unguarded Imperial repair dock. The fighter performed admirably, destroying the facility before the Nebulon-B frigate Virulence could respond. The mission was later recreated as a simulation used in training new pilots. The Alliance Fleet started deploying a number of R-22s at that time. Captain Juno Eclipse and PROXY used a two-seater R-22 to travel to Dac to help Admiral Gial Ackbar and Senator Bail Organa liberate the Mon Calamari and recruit them to the Alliance cause. The fleet used them in the Assault on Kamino against the Imperial TIE/sa bombers. Keyan Farlander flew Spearheads in several missions during Operation Skyhook, and at least two R-22s participated in the Battle of Yavin, one piloted by Jake Farrell. The Spearhead was nicknamed "A-wing" among Rebel pilots. The name "A-wing" persisted when the model was modified by General Jan Dodonna and Walex Blissex after the Battle of Yavin into the Rebel Alliance's fast RZ-1 A-wing interceptor. What those modifications entailed and how they differed from the Spearhead is unknown, though it is known that Dodonna's decision to create the RZ-1 was largely driven by the Alliance's lack of a starfighter that could match the TIE/LN starfighter's raw speed. Additionally, the RZ-1 was also noted for its improved maneuverability, therefore the difference lies most likely in the engine design. In addition to better engines, the weapons complement might have undergone a similar change, as early Spearhead-models were noted as using green laser ammunition rather than the red/orange seen with most Alliance fighters. Though most sources established that the A-wing was introduced by the Rebel Alliance after the Battle of Yavin, some EU sources deviate from this and show A-wings in use before Yavin, notably Star Wars Droids, Star Wars: X-Wing, Star Wars: Rebel Assault, Star Wars: Force Commander, and Star Wars: Empire at War. This inconsistency was eventually reconciled in The New Essential Guide to Characters, where the pre-Yavin appearances of A-wings were retconned and explained as being R-22 Spearheads instead. 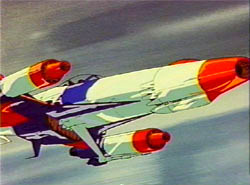 The name is similar to that of the R-41 Starchaser and R-60 "T-wing" Interceptor, and the Spearhead may, like the Starchaser and T-wing, be a design of Hoersch-Kessel Drive, Inc. The R-22 was lnown to have a two-seater variant of the design. If the two seater version is used, increase the cose by 10,000 credits, and decrease the Cargo Capacity by 40 kilograms. Being a prototype, the R-22's laser cannons cannot swivel and rotate like those of the RZ-1, and Fire Control is reduced to reflect this. Also, while the R-22's laser cannons seem bulkier than the RZ-1's cannons, this does not mean they would be more powerful. Instead, the bulky casing would have been stripped away to modify the laser cannons to have the rotating ability they are known for in the RZ-1. This also could explain some of the A-Wing's notorious reputation for needing high maintenance and constantly breaking down, as these laser cannon mods could have been a jury-rigged field mod with a repair skill instead of an advanced engineering skill, then widely spread due to ease of use to perform the mod, and its use and high demand in a starfighter dogfight. I had originally wanted to write-up the Resistance A-Wing (Kuat Engineering Systems RZ-2 A-Wing), however, finding references to the R-22 here, I decided to do it up first, technically creating a reference for the RZ-2. Kuat Engineering System's R-22 prototype here led to the development of the Rebel Alliance's RZ-1 A-Wing, which led to the Kuat Engineering Systems RZ-2 A-Wing that fell into Resistance hands later on. -Greater Cargo Capacity, later used for modifications leading to what became the RZ-1, as this space is taken up by modifications and upgrades. -The engines are modified and enhanced (+4 Speed). -The maneuvering thrusters are modified and enhanced (+1D Maneuverability). -Installed a better hyperdrive (x1). -The hull plating was stripped to minimal necessity to reduce mass and increase speed (Hull -1 pip, trade-off for +1 Speed). -Installed better Sensors package in the RZ-1 to better perform its many roles as a high-speed starfighter, such as interceptor, reconnassaince, and stealth. -Installed the Enemy Targeting Jammer. -(If using the original WEG D6 A-Wing stats) The concussion missile launcher was removed, reducing mass to help increase speed. The RZ-1 A-Wing has 40 kilograms of cargo space. Here, I gave the R-22 prototype more because it is eventually modified into the RZ-1 we all know and love. As an unmodified prototype, the R-22 will be lacking many things the RZ-1 is known for, such as speed, changing certain stat dice codes (RZ-1 had less Hull and Shields for increased speed, etc), weapons strengths, and specifically it would not have the jamming device. When the R-22 is eventually modified into the RZ-1, much of this 100 kilogram Cargo Capacity will be taken up by these modifications, though some of these mods may also be external or enhancing what is already there, which usually does not take up Cargo Capacity. The "new" price listed is higher than the RZ-1 A-Wing because the R-22 fighters were originally prototypes. In line with the idea of concept cars and other such "unique" creations, prototypes would probably cost much more than the mass production run of the same or similar starfighter, and in all likelyhood this cost should probably be higher, maybe even twice that of the RZ-1 A-Wing or even more. The "used" cost is because due to the Empire rejecting the R-22 design, Kuat Systems Engineering then would have found itself with a batch of prototype starfighters with no buyer, and they probably would have wanted to recoup these losses somehow. Hence, KSE sold the R-22 prptotypes to the world of Tammuz-an. After that, these fighters may have very likely been reproduced to create more, explaining why so many have appeared (and been destroyed) over the course of many years, if not decades, before we finally see the RZ-1 A-Wing in action. The used cost may also be off, perhaps should be less, but the key factor here is that whatever the R-22 sold for when Kuat sold them off, the difference between this price and the final cost of the RZ-1 A-Wing may in fact be the cost of the equipment and upgrades possessed by the RZ-1 and not the R-22, such as the jamming device the RZ-1 is reknowned for. These upgrades and costs should also take into account the R-22 being stripped down in many other ways to increase other abilities, namely speed. While the speed listed for the R-22 is 8, some GMs/players may think this is too slow. 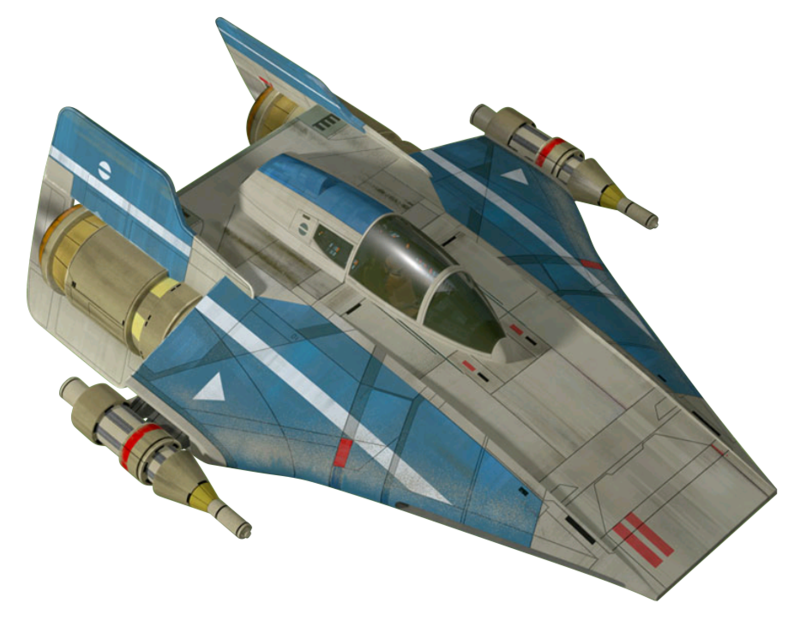 Since the A-Wing series of starfighters are intended as replacements for the Delta-7 Aethersprite and related variants, the R-22 should come off as something in the middle. If GMa/players feel the Delta-7 or Delta-7B would have a faster Speed than 8, then the R-22 should have a higher speed too. Just keep in mind that the R-22, as well as the Delta-7 series, should have Speed less than the RZ-1 A-Wing, as that fighter gained its speed due to stripping down and modification by the Rebel Alliance. All in all, if GMs/players feel the need to increase the R-22's Speed, a 9 would do it, maybe a 10 but that might be pushing it. It thereby seems perfectly reasonable that, at a cost of 180,000 credits, the R-22 Spearhead, built for speed, would have Space 10. I might also suggest it is a little more believable that the Alliance would tweak an already TIE/LN-competitive fast design to go from Space 10 to 12 than choose an expensive design with average speed and try to increase its speed by 50% (!). The Millennium Falcon has a space speed of 8. But the stock YT-1300 has a space speed of 4 (if that's incorrect, please feel free to give me a source to go check). The stock ship is like the standard civilian car a person would buy in real life with a average decent speed. But the Falcon is like if that stock car were in the possession of a mechanic who loves improving those cars to perform better, go faster, take turns tighter....improving every aspect of that car as much as possible. But in the end, it's only a stock car. You can only do so much with it, and it's not like having a more expensive performance car, available to civilians but with ridiculously high price tags that restrict them to the wealthy (like a lamborghini was back in the 1980s/1990s, or whatever the rich man's fast car is now, maybe a Koenigsegg or Lamborghini Reventon). And that fast car isn't going to be nearly as fast as a car built dedicated solely to nothing but racing and/or speed, like an F1 formula racing car, and the like. The way I looked at A-Wings in relation to other starfighters for the longest time, since around 2000-2001, was as starfighter scale racing craft built solely for speed and nothing else. And since they were heavily modified from some other form, me and my gaming group often tended to rationalize that this is how they started before the Rebel Alliance got their hands on them. At the time, we didn't have a confirmed info source for the in-depth history and background behind A-Wings. Just what was in the game books. The internet wasn't like it is now, and it was several more years before I realized just how trustworthy Wookiepedia is due to the faithfulness of its community (If you disagree, that's fine, but it's still better than every other franchise-inspired wiki out there, except maybe Star Trek's Memory Alpha). For me, civilian space speeds are between 1-6, and military speeds tend to be 4-10, with 11-12 being rare exceptions. 1-2 is slow (like the Smoking Blaster, a slow starter group ship from the Gamemaster's Guide, but obviously meant to be improved and upgraded over time); 3 is about middle, what civilians and slow transports not worried about schedules would use to get around the galaxy; 4 is decent, slightly better than middle speed, a stock cheap civilian car with good speed; 5-6 is the high end of the cheaper civilian cars/starships that can be purchased as-is. Beyond this, you start getting into after-market modifications and upgrades, taking the stock civilian cars and boosting them to do better. For me, that would reach up to/around space speed 8. Then you've got the "lamborghinis", the civilian fast cars that cost a lot. For me, these would "start" around space speed 6, easily reach 8, and possibly get up to 10 (if applied as some kind of personal ship in Star Wars, the owner would probably need some special permit to own and fly such a ship, but if they're wealthy, this won't be a problem). And finally, you have the cars/starships that can reach beyond this, because they are purpose-built for speed, probably cost more than the "lamborghinis", especially when it comes to maintenance (formula 1 race cars) or other things like needing entirely different fuels and such. This is where you get the standard TIE/LN which can reach space 10 (which is purpose built to be as fast as possible, but as cheap as possible for mass-production, therefor as physically weak and low-powered as possible, but all-in-all still extremely fast) and the A-Wing that reaches space 12 (this is the formula 1 race car of Star Wars starfighters, fastest one of its time, but not nearly as weak as a TIE/LN, has more durability, and some decent bite to it). I also mentioned military ships. Military ships, especially starfighters with offensive weapons and defensive shields and other countermeasures, would require permits or some other form of allowance, such as being a member of the military. Military starfighters, transports, etc, could have slower speeds, but might make up for this with stronger weapons, hull, shields, etc. Usually, whatever the common military ships are, they are meant to be able to run down whatever the common criminal ships are of the era of time, or in their area of operation. So if the criminals have ships with speed 3, speed 4 ships would work just fine. They have speed 5? Fine, military has speed 6. And so on, and so forth. Escalation. TIE/LN fighters are speed 10, and every starfighter before and during their time seems to stick around speeds of 5-8 (Headhunters and Y-Wings were space speed 7). I chalk this up to the Rebel Alliance using whatever they could get their hands on, often cast-offs from both sides of the Clone Wars, or periods immediately before or afterwards. The Rebels didn't start modifying ships, like the R-22 Spearheads, to be as fast as they are until there wasn't much choice left for them, and they really needed them. Which goes back to escalation, as the Empire introduced the TIE Interceptors, which weren't superior, but could still hold their own against the A-Wings. OK, to sum all this up. I gave the R-22 Spearhead a space speed of 8, because I saw this as a pretty darn fast speed for a ship from during, or just after, the Clone Wars. I could see the Aethersprite having speeds of 6-8, making it very fast for its time, and being somewhat nimble, but all in all being weaker in hull, shields (if it had any), weapons (again, if it had any), due to it relying heavily on being designed for a Jedi to make up for any design slacks with their Jedi abilities. The R-22 Spearhead maintains that speed, while gaining what's needed to non-Force users to use the fighter, and hold their own, if not win in a battle. Also, and more importantly here, the R-22 Spearheads shown in Star Wars Rebels often were overrun and taken out by TIE/LN fighters. Because the TIEs were faster, and maybe also more nimble and maneuverable (R-22 Spearhead may need to have Maneuverability reduced). This constant loss of R-22 Spearheads during SWRebels would have been what spurred the Rebel Alliance to make the RZ-1 A-Wings, to have a solid counter to TIE/LNs, as well as any other fighter the Empire had to throw against them at the time. Y-Wings were the workhorse the Rebels had in abundance. R-22s were used a lot before they got the Y-Wings. Then the X-Wing came along, more rare, but more balanced, and very much able to hold its own against TIE/LNs, making up for lack of speed with improvements everywhere else, which the R-22 just couldn't do. Then you get the B-Wings with overwhelming firepower, and the A-Wings with overwhelming speed. When you fit the R-22 Spearhead in a timeline (Star Wars Rebels), and consider escalation along that timeline, it having weaknesses starts to fit quite well. I definitely get what you mean, because the A-Wing normally is the ultimate hit and run fighter, but in Rebels, they're definitely average. Tie Fighters often outrun them, out maneuver them and outperform them in nearly every way, it would be clear that the Rebel engineers would seek to improve the ships that they've got, and save their valuable pilots lives. Something I've also noticed is the Technology drop off between Clone Wars and the Original Trilogy. 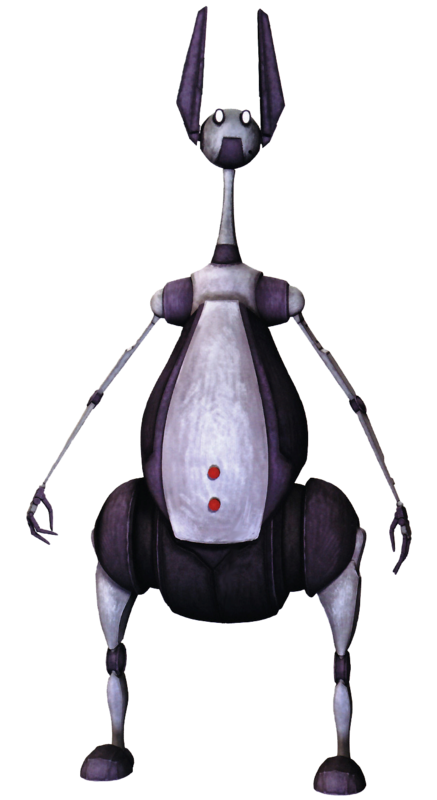 Technology used during the Clone Wars is the best that the Galaxy can develop, but by the time of the movies, the Rebels are using Y-Wings rescued from the trash heap, and civilian fighters which would be seriously outclassed by Clone Wars era ones. Clone Troopers armour is considered the high point, and although the Storm Trooper armour has some refinements, it's far weaker according to background material. I can understand the Empire cutting costs, and not really needing the best to defeat the disorganised Rebels. But I'd assume that someone wanted to hang onto the best (even if we never saw it in the movies), some Clone Trooper still serving with the Empire in his old armour because it's better, some ace pilot in an Eta-2 Actis instead of a Tie, etc. Freddy. The technology gap is easily explained. In Ep2 Attack Of The Clones, we the audience are first shown the alliance of organizations backing the Separatists (Trade Federation, Banking Clans, Techno Union, etc). These groups dominate specific aspects of galactic business and economy. While the outcome of these organizations is not depicted much in ep2 or 3, the Clone Wars series does give us more information. We see the Banking Clans taken by the Republic, granting them unlimited funding, while stifling funds for the Separatists. With this example, after the Clone Wars and the Republic becoming the Empire, it makes sense that all of these organizations were nationalized by the Empire, with their resources directly benefiting the Empire, but purposely not being available to the rest of the people in the galaxy. Hence, older ships become more common sights for anyone not affiliated with the Empire. Using older ships would be the only way to go for the Rebel Alliance, with exceptions of the few people willing to bring newer, more powerful ships to their cause, such as Imperial crews in mutiny to take control of Nebulon-B frigates, or Mon Calamari forces bringing their star cruisers directly into the Rebel's fleet. -Stormtrooper armor being weaker than Clone Trooper armor. I just chalk this up to the same efect as the TIE fighter. Cheap, mass produced in bulk, overwhelm in quantity instead of quality. Simple enough. For better trooper, the Storm Troopers DID have more elite troopers, like the Storm Commandos, the Death Troopers, and others, etc, and many of these did possess better training, armor, all that stuff. -As for Clone Troopers still serving with the Empire, I don't know. 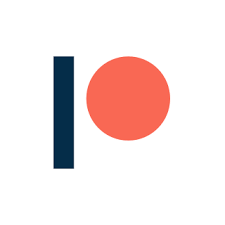 I think they were all "phased out" on purpose, but I don't know what story this would be in. If Clones did still serve in the Stormtroopers, the change in armor is simple: orders from superior officers. Since everything in the military, even the real world, needs to be standardized, every soldier wears the same uniform, same armor, carries the same weapons, eats the same food, etc. Elite units may have some differences, but for rank-and-file soldiers, they all have the same gear. Since Clones were bred and raised to follow orders, if ordered to replace their gear with the "new standard", they may balk at it, but they will follow those orders. -As for the Eta-2 Actis pilot, again this would go back to standardization. Where the clones are ground troops or marines on starships, and therefor easier to keep their older gear, especially if they had achieved some form of elite status.......pilots may not be so lucky. If the Eta-2 Actis were designed by the same people who designed the TIE series, then maybe the Actis could be retained. This would only be if the pilot was from the period the Actis was used in, and if they had achieved their own elite status. But, those pilots would eventually be promoted out of the cockpit, or stop flying combat missions when their bodies could no longer handle the rigors of starfighter piloting due to age. 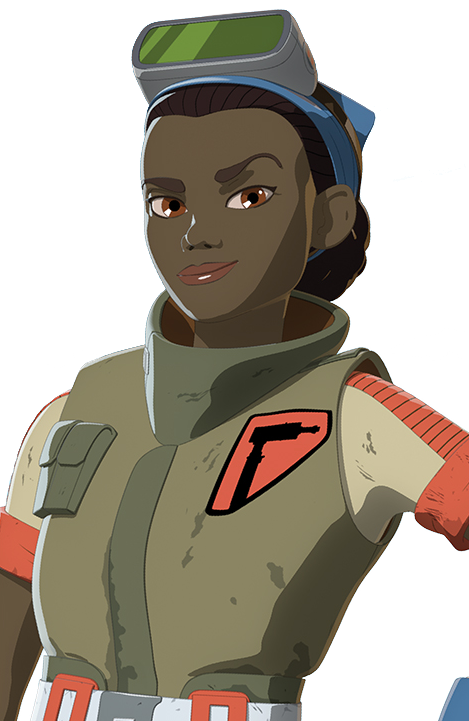 While individual elite pilots may be allowed to keep their Actis fighters (not like the Empire would want them after so long, ya know? ), any and all new pilots coming up through the ranks would be introduced to TIE fighters, and probably never be allowed to have anything but a TIE or its variants, even if they reached some kind of elite status. This is shown in many examples, one of the most recent of which is the campaign story in Star Wars Battlefront II, as Iden Versio and her elite squad of Imperial badasses have TIE fighters, suped-up and improved, but they're still just TIEs. My thinking on an Imperial unit having non-TIE fighters leads me to think such a unit would be off-the-books, kept at arm's length to distance their actions, and appearance, from the Empire, could easily be disavowed if needed, and would effectively like mercenaries of some kind due to having such autonomy. If such an Imperial unit existed, whose members did actually start out as Imperial pilots or other soldiers, they would probably be a highly skilled wet-works team, with very loose morals (if they had any at all), and would probably have no limits as for how far they'll go (whether it concerns the mission or not), yet they would have to have a nigh-fanatical devotion to the Empire and its "ideals" in order to stay together as a cohesive unit. Unit organization could also be composed of people who simply like what they do a little too much (KILL! ), but be held together and kept functional by at least one or two of the fanatic types mentioned earlier, who are just that good at pressing all the right psychological buttons in their team members to keep things operating smoothly (plenty of down-time and leave between missions would also help). Such a team, aside from wet-works and assassination, could also be used for undercover operations (finding and infiltrating Rebel cells), and could also be used for great P.R. (use their non-Imperial starfighters to attack civilian targets....even better if they actually have infiltrated a Rebel cell and operate as members, loudly declaring devotion to the cause! (only to not be there to defend said Rebels when the Empire comes after them, having left them right before such an attach, perhaps also causing sabotage while making off with anything they could in the process)). I think there is also another reason why there is no more clone in the stormtroopers: they may simply be too old! Since they are modified to age at increased rate from 0 to 20 years (in 5 years), we can assume that they may age at acelerated rate after this (considering an accelerated biological regeneration may increase healing rate and the war was not planned to last for centuries...). 2- the facts there is no more clone in the Empire troops. Even with the progress of medecine, 60+ yo bodies are a little old for front lie soldiers, don't you think? As for the use of Clone Wars material in Empire army, I don't think it matches the Empire strategy of mass and uniformity in the military. Some of this ships and weaponry may be preserved for special forces actions, where imperial troups must not be recognised.